These are the very last days of harvest on Leclerc Briant's vineyards. Leclerc Briant's vineyards make up 30 hectares, spread over 6 villages between Verneuil and Montagne de Reims (near Epernay), along the Marne Valley. This 0,6 hectare Chardonnay plot [pic on top] is being harvested by a team of 12 pickers and the boxes are hauled all along the day in vans to the winery in Epernay, 26 km away. The Verneuil plots are planted with 70% Pinot Noir, 15% Pinot Meunier and 15% Chardonnay. The pickers, like often in Champagne, are gypsies who come in the region in large numbers for the harvest, and whose trailer settlements can be seen here and there near the villages. They work efficiently and their nomadic lodging culture adapts well with the lack of housing for harvesters. The harvest must be 100% manual in Champagne, and that makes a lot of people to accommodate for 2 or 3 weeks (100 000 according to Pascal Leclerc Briant). Pascal Leclerc Briant [pic on top] heads one of the very few Champagne estates which follow the organic and biodynamic rules: 15 estates or so have a certified organic viticulture in Champagne, and less than a half of that number follow biodynamics among a total of about 15 000 growers... The climate in Champagne is not the easiest for that type of farming, and the high demand for Champagne wines makes also vignerons less prone to try and take risks for healthier farming practices. But more of them have second thoughts because of the results and the increased quality of the wines and have applied for reconversion. The fact is, some practices in the past in Champagne were far from "organic". 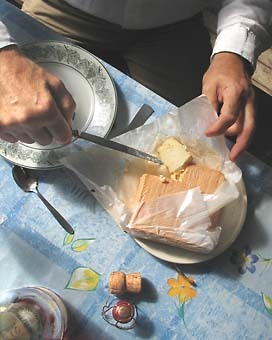 For years, for example, some growers bought grinded trash from the Paris area to be used as compost in their vineyards (see this article by the Organic Wine Journal) and even though this is forbidden since 1998, you still can see in some vineyards across the region tiny pieces of blue plastic bags on the ground. Leclerc Briant progressively converted its vineyards to organic viticulture and biodynamics from 1989 to 2000, but even before this conversion, Pascal's father (who had tried the organic way as early as 1962) favored deep plowing for example. It could be the reason for the smooth transition. Pascal L.B. says that they observed during the trial years that their organicly-farmed vineyards had 5% less grapes (lighter grapes), but fortunately, the increase of quality easily allowed a price compensation. The price range at Leclerc Briant is still very affordable, though. Violent hailstorms pounded the region early july, causing major losses on some vineyards across Champagne, and some growers lost 50% of the crop. At Leclerc Briant, 3-4% of the crop was lost, mostly on the Verneuil location (on the Pinot Noir part) . Otherwise, the grapes were very healthy and the harvest began september 12th. 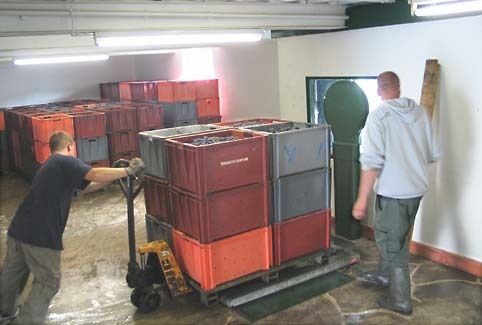 __When the Pinot Noir grapes arrive at the winery, they are weighed first, then the boxes are emptied in the vats for full-cluster fermentation. For both the red and the whites , only indigenous yeasts are used at Leclerc Briant. That is also not common in the Champagne Appellation. Plus, it would be way too risky to do that with grapes from a conventionally-sprayed vineyard, as they don't develop the good yeasts naturally. 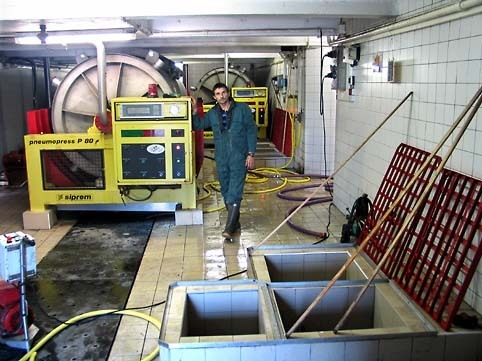 __ The white grapes go to the press (more or less 4000 kg of them for a load), and the different qualities of juice are successively extracted and stored in 3 vats. This separation of juices from the same press-load is possible with a very smooth, gradual pressing beginning at 400gr. The first juice, called "jus de pressurage", is the one with the best acidity. At Leclerc Briant, they use only the top (2/3) tier (in terms of quality) of the juice. The rest, which is less qualitative and has a darker colour, is sold to other wineries. __ Rosé Champagne. They have always made rosé Champagne at Leclerc Briant. The winery has always been Pinot-Noir centered, and its rosés are not a mix of red wine plus white wine (like often elsewhere), but it is pure Pinot Noir. One of the ways to see the difference is that the white-red-mix rosé develops an orange colour after 2 or 3 years while the 100%-Pinot-Noir rosé retains its redish colour. That is because all the wine has been in contact with the tannins and the skin. The other wineries often mix 10% of Pinot Noir with white wine (this is the only french region where such a mix is allowed to make rosé wine). Leclerc Briant's rosé is probably the darkest rosé in Champagne [see pic upper left]. __I first tasted a Champagne Leclerc Briant Millesimé 1995. Classy and rich mouthfeel. A pleasure. __ Then, Champagne Leclerc Briant, Rosé de Noirs 2001. This is the Pinot Noir rosé [pic upper left]. At first, was it me ?, I had difficulty to adapt after the white 1995. But after 10 minutes, I really fully appreciated this rosé Champagne. Drier feel than the former and Complexity. The wine opened itself with more flavour intensity as we sipped and chatted. Try it like we did with Maroilles cheese, the traditional harvest cheese made near Reims, a firm but smelly cheese of the type I like [picture on the right]. The interesting part of the tasting was also the "Les Authentiques" range, Champagnes cuvées made from individual climats, or terroirs. This is an unusual move in Champagne, where most wines are blended wines from different locations. These terroir Champagnes are made for 12 years now at Leclerc Briant, and they render the distinctive particularities of the selected plots. ___La Croisette Blanc de Blancs "Les Authentiques". The new wine of the Authentiques range. 100% Chardonnay. Small plot (0,34 hectare), altitude : 120m. 17 year-old vines on 15%-active-limestone soil. Exposition like on Cote des Blancs. Nice generous mouthfeel. 2001 and 2002 blend. This is a wine for aperitif. __ Les Crayères Brut 1er Cru "Les authentiques". Nice complexity with minerality. 35% active-limestone soil. __ Le Clos des Champions Brut 1er Cru "Les authentiques". Freshness, floral aromas. Speaking of the size of the estate, it is small compared with big names of Champagne : Leclerc Briant makes 250 000 bottles a year compared with 25 million bottles at Moët & Chandon. 60 % of the Champagne is exported : to the U.S. (Pascal studied a year in the US in 1974-75 both at Finger Lakes (N.Y) and Davis,California near where he stayed at Tim Mondavi's place), Italy, Switzerland, the U.K., Belgium and Japan. Passy sur Marne, a Champagne village along the Marne river. You can see the vineyards on the slope, and a gypsy settlement on the lower right. This was a nice visit. Thank you to Pascal Leclerc Briant ! I didn't know that the grinded trash was used as compost before. I know it's very hard to grow the grape in Champagne. Anyway it's good that the harvest in Leclerc Briant is going well in this year. I wanna try one if I find it. I really enjoyed reading this article. I am visiting France for the first time December 26, 2006. Due to unfortunate circumstance my friend in the south of France is not able to meet with me so in the last week I’ve be scrambling to make arrangements. I would love nothing more then to visit Leclerc Briant my concern is that you may not be open so close to the holiday. I am single and traveling alone and am planning to make this visit an amazing adventure and life experience in such a romantic and beautiful country. I am hoping you might be open December 29, 30th and or earlier December 31th? I can’t imagine a better way to experience or celebrate the end of a year and the begin another then to indulge you senses with wines with their bouquets, textures, complexities or the tiny explosions that delight you senses. It is alive, a science and every changing. My hope is also to purchase several bottles of wines and champagne’s and have it shipped to my home in Philadelphia, USA, if allowed. I realize that there is a very good chance that you may be closed for the holidays and I may very well be disappointed. If that is the case, might you be willing to suggest any vineyards or producers that might be open? My plan is to take the train from Paris, however I may rent a car obtain a map and pray I don’t get lost. I will be staying at this location I found in google, 02130 Fère-en-Tardenois near Reims 31 Dec-06 until the 1- Jan 2007. However, I’m sure I could take a train earlier if you are available for a visit / tour or for me an exploration. If you know of a place to stay the 29 th or 30th of December, I would be open to that as well.